*Recommended drive away price for TRAFIC SWB 66kW Turbo with solid paint valid for orders before 30/04/2019 and delivered prior to 31/05/2019. ABN buyers only. Renault reserves the right to vary, extend or withdraw this offer. **No Repayments for 3 months offer is available to approved applicants of Renault Financial Services (Australian Credit Licence Number 391464) only. Maximum term 60 months. Terms, conditions and fees apply. Interest is calculated from the settlement date of the fixed rate contract. Offer available on new and demo KOLEOS, CAPTUR, CLIO, Master, KANGOO and TRAFIC vehicles purchased between 01/04/19 and 30/06/19 and delivered by 30/07/19. Excludes Government, Rental and National Fleet customers. Renault Financial Services reserves the right to vary, extend or withdraw this offer. 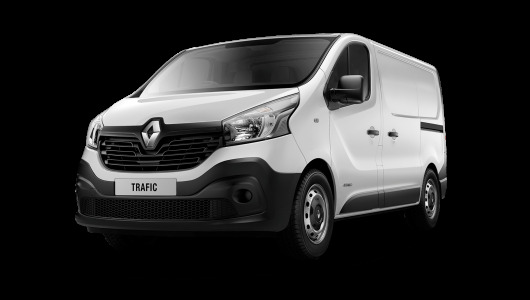 †3 years unlimited km warranty is valid for all new Renault Commercial vehicles. Demonstrator vehicles receive balance of new vehicle warranty. ^Refer to http://www.renault.com.au/ownership/servicing/capped-price-servicing for information regarding the capped price servicing of these vehicles. For vehicles purchased from 1st January 2018 please refer to the Capped Price Servicing information contained here. *Recommended drive away price for TRAFIC SWB 85kW Turbo with solid paint valid for orders before 30/04/2019 and delivered before 31/05/19. ABN buyers only. Renault reserves the right to vary, extend or withdraw this offer. †3 years unlimited km warranty is valid for new and demonstrator models. ^Refer to http://www.renault.com.au/ownership/servicing/capped-price-servicing for information regarding the capped price servicing of these vehicles.